On the fourth floor of American University's Spring Valley Building, past the silver-colored elevators and around the narrow bend of uniform offices, the Dean's Suite to the School of Professional & Extended Studies (SPExS) is buzzing with activity. Cardboard boxes are piled neatly; bookshelves are emptied, save for a few paperbacks on international development, intercultural understanding, and foreign policy theory. And hung on one wall, still, is a vibrant three-panel painting of jazz instruments within a floating whirl of music notes -- a gift from the assistant to the Dean and the alumni relations coordinator. In the center of it all, sitting on a leather couch, is Dr. Carola Weil in focused reflection. "We have created something here that cuts across disciplines, that cuts across different audiences, and that depends and builds upon relationships with others," says the founding Dean about her work at the School. Come June, Dr. Weil will leave American University for a Deanship at McGill University in Montreal. 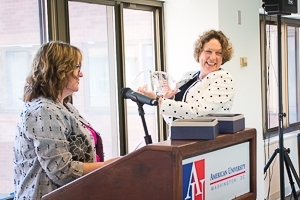 With this transition, she leaves behind a legacy that has at once opened AU to new audiences in the world of experiential learning and enriched the communities within through innovative bridge programing and skills-based degree offerings. In so many ways, Dr. Weil has lead a movement that continues to redefine the future of the workplace and of lifelong learning. "I have always thought of higher education as one of the core pillars of civil society. If you think of all the different parts to a university as a tool kit for life, then [continuing education schools] are the tool that connect universities to the broader society, helping individuals navigate their professional development at critical junctures in their career paths." With a team of dedicated individuals, she has built innovative online and in-person bridge programs for undergraduate and graduate-level students and mid-career learners, specialized ESL pathway programs, as well as executive and custom programs. Focused on key transition points in one’s professional development, the School has sought to provide growth opportunities to learners of diverse backgrounds and needs, including those who might not otherwise seek out American University. Since its establishment as a full-service, degree granting faculty six years ago, American University’s School of Professional & Extended Studies has challenged the traditional framework of how an academic institution serves its learners and prepares them for the real world. Anchored in the core values of experiential learning, the School is now a hub for applied learning and cross-disciplinary exploration that connects learners with the workforce in concrete ways. "It is no longer good enough for institutions of higher learning and continuing education to train people for the jobs that exist. We must prepare them for the jobs that might not even be invented yet," she explains. To Dr. Weil, the School works to bridge the gap between the AU community, employers, and institutional partners around the world, thereby making the University "a more networked place." "I always felt that I myself would not fit a particular box in higher education, [and] always saw academe and higher education as a place of exploration, a place of adventure, a place of growth. I keep coming back to it specifically because of the impact that you see in students and the faculty and the staff we've touched." Much of her success, Dr. Weil concedes, is due to the impact of incredible mentors she has had along the way. At the University of Maryland School of Public Policy, her Masters mentor, Dr. Catherine McArdle Kelleher, first introduced her to the notion that women can have careers outside of industries traditionally expected of them at the time. Similarly, another long-time mentor, Dr. Ernest J. Wilson III, encouraged her to advocate for more inclusive societies and supportive environments for individuals who might otherwise be excluded. She also describes a passion in giving a voice to those not readily heard or seen, born out of her own personal experience as the daughter of a holocaust survivor and refugees, as well as in fractured societies. "I see myself as the consummate lifelong learner, and I attribute much of my way of being to my late father, a [German diplomat] who was self-taught and continued to learn throughout his life. He survived and succeeded many odds as a holocaust survivor." Dr. Weil was born here in Washington, but, as the daughter of a diplomat, her childhood was spent living in Germany, Switzerland, present-day Myanmar, Brazil, and Ghana among others. During her academic career, she conducted doctoral work in Rwanda and the Democratic Republic of the Congo. While at the U.S Institute of Peace she helped grow programs to advance women, and strengthen the media in Afghanistan, Colombia and Pakistan. She criss-crossed this country as well – from Philadelphia to Detroit, and LA, back to Washington DC. Before her tenure at American University, Dr. Weil served as Sr. Associate Dean and Director for Strategy and International Initiatives at the University of Southern California’s Annenberg School for Communication & Journalism. Being uprooted in order to conquer new and exciting challenges, it seems, has always been a major part of her personal and professional life. "From an early age, I understood that my roots are not place-based. Rather, they are connected to people that I care about and the work that I care about, and, as long as I have work that is meaningful and that makes a difference in people's lives, I feel that I am fulfilling my obligation as a world citizen." In joining McGill University, Dr. Weil will broaden her world citizenry to include Montreal, Canada, where she will join their globally-ranked public research institution. She looks forward to "being able to build on prior success, and taking on some new challenges too." "I think we have opened up more of the world to American University than was previously possible. I'm excited to have been part of the effort [that brought American University] to venture into new areas of workforce development, of experiential learning, and [advancing] the university on the global stage." "And, who knows," she smiles. "Maybe we will be able to strengthen the partnership between McGill and American University."